Surat:2/9/18 A two-day long festival, Odisha Parba has been organised at Surat International Exhibition and Convention Centre (SIECC) in Sarsana of Gujarat which begins from today. The festival will showcase the rich tradition, culture and heritage of Odisha. Gujarat Chief Minister Vijay Rupani and Union Minister of Petroleum and Natural Gas Dharmendra Pradhan will grace the occasion. The festival will provide an opportunity to the people to know about the art and culture of Odisha, it’s delicious food, traditional folk dance such as Odissi dance and others. In the two-day long festival, Odisha’s culture such as Droka, Chandua, Pattachitra, Tarakasi, Nreguna saree, and many others will be showcased. 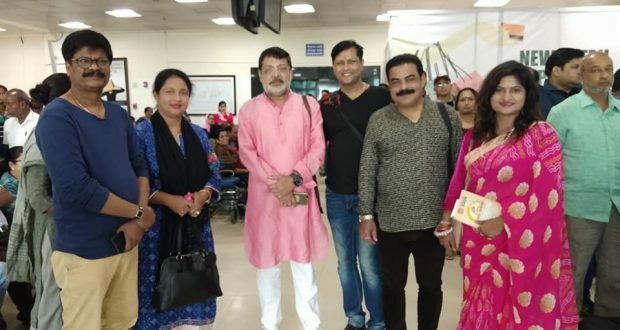 Odisha’s famous singer- Krishna Beura, Abhijit Majumdar, Sohini Mishra, and Satyajit Pradhan will enthrall the audience with their songs at a musical event here. This apart, a replica of the three chariots of the Trinity- Lord Jagannath, Balabhadra and Devi Subhadra has been displayed at the entrance gate of the event to give it feel of religious environment of Odisha. “The Odias residing in different parts of the country are enjoying the culture outside the state with such festivals,” said Odia Samaj President Siddharth Pradhan. Previous: Bhubaneswar:2/9/18 : Dr Basant Kumar Mishra has made all of us proud on being selected for the prestigious Dr. B C Roy National Award, the highest Honour in Medical field. A Neurosurgeon of repute, he will be an inspiration for students pursuing medicine for the state. Heartiest Congratulations.